Lahari Goswami, 25, was looking for a convenient breakfast alternative after she moved out of her parent’s house. She started having oats while working in Chennai, and would sometimes have idlis in the office when she was really in a hurry. Now that she has moved to London for further study, she eats muesli and assorted fruits with soya yoghurt. “It’s faster to make”, she explains, “The yoghurt is easily available in shops, and I can chop up some fruit and store it in the fridge on the night before so that everything is ready to go in the morning.” The homemade hot food her mother used to make every morning is a distant dream for now at least. 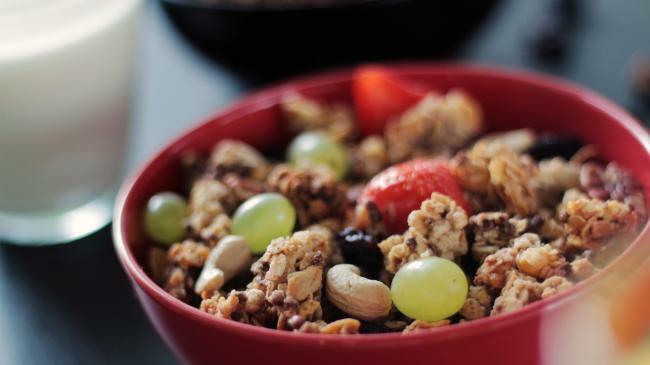 Even in India, breakfast habits are changing fast as a majority of the younger generation of professionals tend to switch over from traditional dishes to western-style ready-to-eat cereals. Many of them even skip breakfast choosing instead to have a hot cup of tea or coffee with a few biscuits to kick off their day. A practice doctors and nutritionists warn as unhealthy since there is a long gap between bedtime and morning. Then some others have become health conscious and have opted to change their diet in order to accommodate their sedentary lifestyles in offices. Western-style breakfasts comprising cornflakes, oats, muesli, etc. have thus grown in popularity. Subsequently, the humble roti or paratha with veggies or bread with butter, jam, or eggs seem to figure less at the breakfast table. Several brands in the market have now come up with western-inspired breakfasts which are quick to make as well as healthy. There is a growing demand especially among the youth for this kind of breakfast foods. However, the quick-to-make breakfast dishes of old times such as sooji, muri chira (beaten flat rice) etc. are now considered to be too time consuming to make. Enter brands that offer packaged solutions to this problem – instant upma, instant poha, and whatnot. These help fill in the demand for Indian breakfasts by offering two-minute recipes for foods that would otherwise take a little longer to make. Afsana Bose, a homemaker, eats muesli with milk and a few nuts for breakfast, and she often makes instant upma for her daughter’s breakfast, and sometimes even for a quick evening snack. The entire cooking process for the upma is fast and extremely easy, just requiring heating and the addition of water. Even children can make these quite easily with a little supervision, helping them become more independent in the home. Having these at hand helps increase one’s options when one wants a quick snack, offering choices other than buttered toast. Sriparna Roy Chowdhury, a guest lecturer at a college in Kolkata, usually eats breakfast at home – ranging from cornflakes to muri to oats – “I usually just eat whatever is available on the given day”, she says. Sreejita Majumder, a postgraduate student, is a health fanatic. She puts in a lot of effort to lead a healthy lifestyle and thus has two egg whites and two pieces of brown bread for breakfast. Sometimes she eats muesli as another healthy and fast alternative. While faster breakfasts have indeed been taking the country by storm, it is a misconception that only western-style foods can be the quick and easy solution. Meanwhile, the Food and Agriculture Organisation (FAO) of the UN has accepted India’s proposal to declare 2023 as the ‘International Year of the Millets’. The idea is to improve production of this climate-resilient and traditionally nutritious crop. In India we know it as jowar (sorghum), ragi (Finger millet), bajra (Pearl millet), etc. Millet provides many nutrients and is considered to be one of the most digestible and non-allergenic grains available. People of the Hunza valley in Gilgit-Baltistan region of Pakistan use millet as a cereal, in soups, and for making dense, whole grain bread. The Indian roti is often made from millet flour. In Eastern Europe, millet is used in porridge and kasha, or is fermented into a beverage. In Africa it is used to make baby food, and as breakfast porridge. Observing the trend, brands like Soulfull, Organic Tattva, and Pristine have come out with a ragi-based cereal. Ragi is no less healthy than its western alternatives. Soulfull’s ragi bites come in a variety of flavours, like mango, strawberry, and chocolate, offering options to those who enjoy flavoured cereals for breakfast. Even Kellogs’ very popular chocos now has a ragi option, thereby helping promote the idea that Indian cereals can also be a healthy breakfast option.